Thai authorities now believe that the rogue band of male elephants that smashed cars at the Khao Yai National Park did so out of sexual frustration not malice, pointing to the animals’ amorous attentions expressed toward a sport-utility vehicle (SUV) encountered down the road away. Miss Jennifer Spencer, 29, the leaseholder of the SUV, which was sexually assaulted by the pack of love struck pachyderms, had a front row seat at the time of the incident. As she found herself trapped in the vehicle during the twenty-one minute long bestial gangbang ordeal. 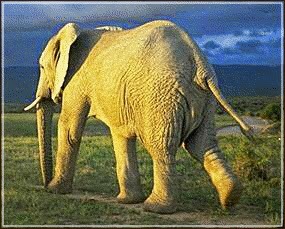 Advantageously, Miss Spencer still had on her seat belt when the elephants took turns mounting her SUV from behind. “I had just pulled off to the side of the road and turned off my engine,” said the still somewhat shaken Miss Spencer to authorities. Miss Spencer was touring the national park alone and pulled off to the side of the road to take some pictures of the unusual sight of elephants standing in the middle of the highway. At that time Miss Spencer was unaware of the earlier violent encounter the elephants standing in the road had with previous vehicles and was only concerned with documenting the moment, while still on vacation from her job as a court stenographer back in Sydney, Australia. Just as Miss Spencer reached for her camera, something in her rear view mirror attracted her attention. “It was all gray,” said Miss Spencer, not realizing she was looking at the underbelly of a 15-foot tall, 16,000-pound male elephantidae Asianess (Asian elephant) that had just mounted her SUV. Just one of the roaming Romeos cruising the national park reserve looking for a little action and that would be the first of many elephants to come. Park rangers had been tracking the marauding beasts for days, trying to curtail their unwanted advances toward cars, hollow tree trunks and village wells. “The elephants were unsuccessful at their quest to procure a mate,” said a park official. Park rangers believe the love sick male elephants had been sexually aroused by the scent of the other female Asian elephants in the national park when they smashed cars and then come upon Miss Spencer’s SUV. Unaware as to the source of her vehicle violently being shaken, shimmered, rocked back and forth and side to side, Miss Spencer began wildly honking her car horn hoping to draw attention to her plight. Moreover, Miss Spencer’s horn honking did not yield the desired results she had hoped for and instead lead to an unintended consequence, as the honking only seemed to further excite the bull elephants into a frenzy. The other male elephants standing around waiting for their turn apparently became inpatient, as they then began to mount each other. Meanwhile, inside the vehicle, due to the violent motion, Miss Spencer suddenly and predictably stopped honking the horn. “She went unconscious,” said a witness. Concerned for Miss Spencer’s safety, a number of witnesses took it upon themselves at great risk to their own lives to distract the bull elephants, hoping to approach the vehicle in an attempted rescue. Would-be rescuers jumped up and down, waving their shirts and arms in the air. However, the elephants seemed single-minded, intent on completing their task. According to some witnesses, the sport-utility vehicle seemed to get into it as well. “I swear the vehicle was enjoying it too,” said another witness, claiming that both the elephants and the SUV climaxed at the same time. “The elephants all bellowed together as the car alarm went off,” said yet another witness. “That’s when I must have woken up,” said Miss Spencer. Miss Spencer was unharmed in the incident. "Fortunately for the victim, the air bags of the vehicle deployed, which acted as a pillow preventing serious injuries to her head," said police. Miss Spencer found herself clutching a depleted air bag, her facial make-up, mascara and lipstick smudged allover it. “Damages sustained to the vehicle were surprisingly minimal and localized,” read the police incident report. There were other SUVs on the road that day, which left many wondering why the elephants chose the particular make and model of the vehicle they did. Since the vehicle was leased, Miss Spencer was fully indemnified for any losses incurred. “I’m so glad I didn’t go with the one that featured the sunroof,” said Miss Spencer, continuing to count her blessings. "And not only because it cost more either." Miss Spencer claims she is no worse for the wear. Even having gained a little wisdom from the experience. Copyright © 2008-2015 by Robert W. Armijo. All rights reserved.